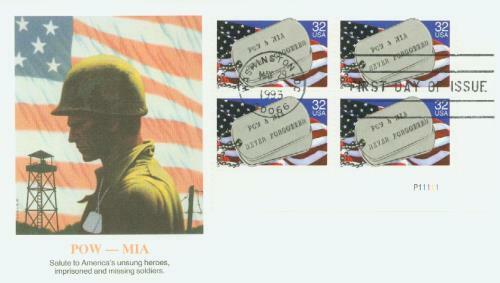 US #2966 honors Prisoners of War and those Missing in Action. On April 9, 1942, the largest number of US forces was captured at the end of the Battle of Bataan, leading to the Bataan Death March. Today, this date is commemorated as National Former Prisoner of War Recognition Day. The Japanese attack on Pearl Harbor was the start of a plan to remove the US and its allies from the South Pacific. A few hours after the attack on Pearl Harbor, the Japanese began bombing air bases in the Philippines. US #2966 – Fleetwood Plate Block First Day Cover. The destruction of planes and buildings, combined with the devastation of America’s fleet harbored in Hawaii, left the troops without the supplies and firepower necessary to combat the experienced Japanese forces. The US Asiatic Fleet was quickly withdrawn, as were the remaining aircraft. Without landing a single soldier, the Japanese had destroyed General Douglas MacArthur’s ability to defend the Philippines. But approximately 31,000 American sailors, soldiers, and airmen stationed on the US base there were left behind. 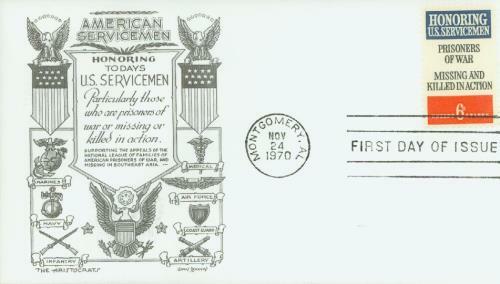 US #1422 – Classic First Day Cover. As thousands of Japanese troops began pouring onto the islands, MacArthur decided only the Bataan peninsula and the island fortress of Corregidor should be defended. The servicemen hoped to hold out until relief could arrive. In the weeks that followed, the refugees were forced to eat lizards and drink filthy water to survive. 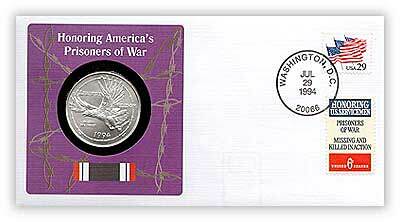 Item #59847C – Prisoners of War commemorative coin cover. On January 9, 1942, the Japanese began assaulting the US defensive lines. Outnumbered and critically short on supplies, the US and Philippines troops held their position until an additional 25,000 Japanese troops arrived. After months of bravely defending the region without aid from naval or air forces, US and Philippine forces ran low on food, medicine, and ammunition. More than 60,000 Filipino and 15,000 American troops surrendered to the Japanese on April 9, 1942. This was the largest force in American history to succumb to an enemy. Though the Allies were defeated at Bataan, the battle slowed the Japanese advance of the South Pacific. 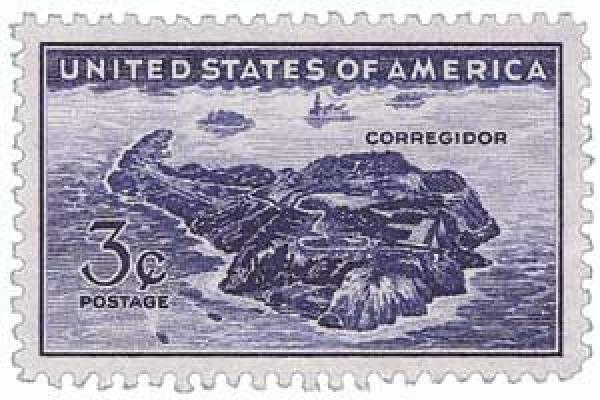 US #925 was issued in 1944 to honor those who defended Corregidor until the Japanese captured it in 1942. The Japanese split the prisoners into groups of about 100 and marched them 65 miles from Mariveles to San Fernando. From there they boarded trains to camps for prisoners-of-war. Though there are no exact figures, thousands of Filipino and American soldiers died during the march and in the camps from starvation and physical abuse. 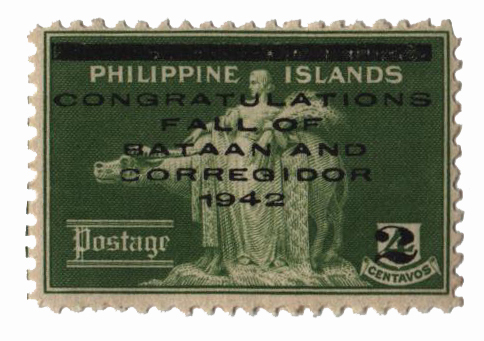 US #PHN8 – Issued under Japanese occupation, this stamp honors Japan’s capture of Bataan and Corregidor. The prisoners of war endured three hard years of imprisonment and torture until General Douglas MacArthur invaded the Philippines and liberated Manila in March 1945. After the war, the Japanese commander of the Philippines, General Masaharu Homma, was found guilty of war crimes for the cruel treatment of Allied troops during the death march. 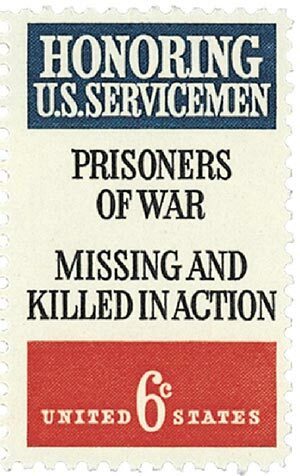 US #1422 – POW-MIA stamp issued in 1970. In 1987, President Ronald Reagan established National Prisoner of War Recognition Day, calling for it to be held on April 9 in honor of the thousands of Americans taken prisoner at Bataan. Click here to read President Reagan’s 1988 proclamation for National Former POW Recognition Day. This entry was posted in April 2019, This Day in History. Bookmark the permalink. 3 Responses to "This Day in History… April 9, 1942"
Thanks Mystic for today’s history lesson. This is not talked about as much as much as the attack on Pearl Harbor months earlier but was also a devastating time in our early involvement of WW II. It illustrated how poorly prepared we were to defend our troops and allies. The way prisoners of war, both American and Filipino, were treated was barbaric. Moving story. I gave 5 out of 5 for the (his)story lesson, that was not known to me. 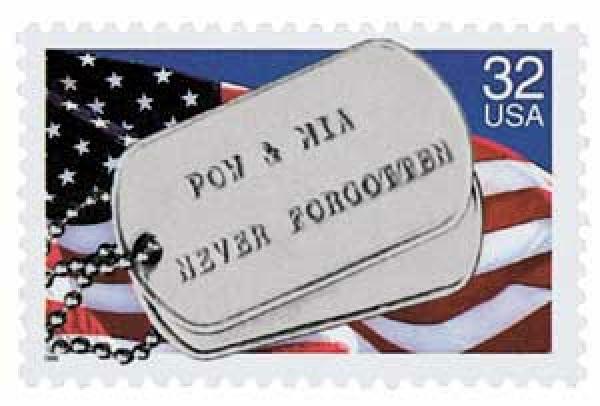 I am well aware of the stamp but didn’t know the story behind it. As a very proud Texas Aggie, this story in legendary in our historical lore. The US Commander at Corregidor was an Aggie and survivor. A very historic moment from this time was the reunion in front of the cave with the A&M survivors proudly holding the flag which is now encased in the center of the Former Students Center at A&M.